As Bitmap Layer: Preserves the exact look of the imported images and imports it in a bitmap layer. 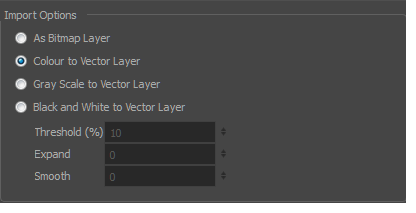 Colour to Vector Layer: Preserves the exact look of the imported images and imports it in a vector layer. 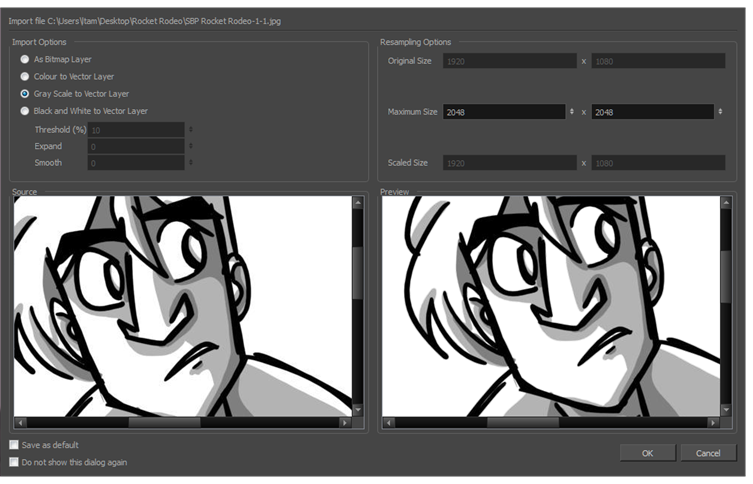 Gray Scale to Vector Layer: Imports the selected images as a gray scale in a vector layer. Maximum Size: Enter a specific maximum size for your imported image to be scaled down to. The original ratio of the image will be preserved during the operation. 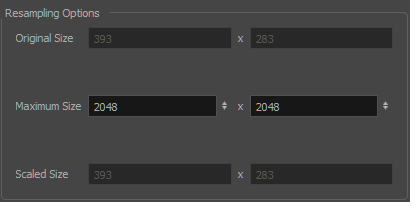 You can see the final values resulting from the scaling process in the Scale Size fields. Note that you can not use these fields to scale up an image. Scaled Size: Displays the final size the image will be scaled after it is imported in your project. Saves as default: Saves the current settings. Every time you open this dialog box, the new default parameters will automatically be set. The import images commands will still use this new default even if you deselect the Display Vectorize Options Dialog preferences. Do not show this dialog again: Deselects the Display Vectorize Options dialog option in the Preferences dialog box directly from here.